Came across this on Engadget, thought it was awesome.. How long till someone here tries this? What could have ended in human chop suey, instead resulted in victory for German engineers at e-volo as they successfully completed the first manned flight of an electric multicopter. 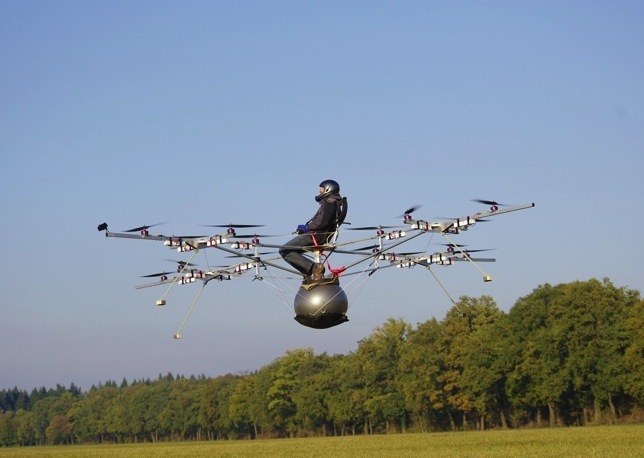 The human death trap multicopter uses multiple mini helicopters to lift the passenger upwards -- who's snuggled in the center of the carnage, firmly strapped to a squishy exercise ball. Like an UAV, the hovering device is controlled via radio control from the ground -- talk about trusting. The passenger was able to hold on for one minute and 30-second of flight victory, causing raucous celebrations from the Wright brothers in aviation heaven. Click past the break for the video. I can't really see a reason why anyone couldn't build one of these. What radio is he using? cool huh.. I want one. I bet that for safety reasons they are using HobbyKing 4ch radios! What a surprise. Or better What else should he have used. Looks interesting but again the skeptic in me remembers WaterMountaneering. What evidence do we have that this is genuine? Any corroborating accounts? Yeah I'd say that looks pretty convincing too. Wow! I counted 16 motors and I think that was a separate battery for each one too. And they all did this within the past couple weeks. Not sure, but I will tell him about it when I see him. Best use of a Pilates ball. Actually that could take FPV into a hole new area!! Imagine making your money out of letting children sit on there and have a flight around (of course safety first, and someelse would controll the plane. Maybe twice or even three times the original flight time of 90 seconds! PS. : I hope that someday, somebody resurects the WASP (aka X-Jet, aka Flying Pulpit): http://www.youtube.com/watch?v=XJARrc40imk (it was pretty much flying Segway). This is crazy! i really would love to do that but i dont wanna risk loosing my life over it. i wonder what control board they used for that thing. Any idea what those purple motors are?? Joke, I don´t think they would use that. They use massively big (I think Hacker motors, due to their colour) and of course those motors are really expensive because they are made in Germany, so I suppose that the Control Board is also something expensive from Germany.